Train accidents in Illinois are often the most dangerous and violent kind of transportation crash any individual can survive. Often times, railroad accidents involve passenger and freight trains, local commuter trains (such as METRA or CTA), locomotives and subway systems. The excessive speed and lack of seat belts on the train can cause catastrophic injuries and wrongful death to train passengers, along with other motorists, innocent bystanders and pedestrians. The railroad system in the Chicago area serves as a strategic component for moving goods and people. However, like all modes of transportation, human error and mechanical failure can lead to significant injuries and death when crashes occur. A train crash accident can kill dozens or hundreds in one catastrophic event. Because of state and federal government agencies, there are different laws for filing for financial recompense if the injuries you suffered from a local commuter or a national common carrier railroad system. In addition, railroad workers injured on the job in a train crash accident must file for financial recompense through different means than passengers are motorists. 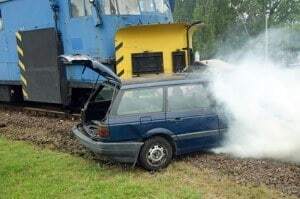 The laws governing a train accident or crash can be extremely complicated. Often times, it takes an experienced train accident lawyer to properly investigate the crash to determine all responsible parties that can be held liable for negligence. This often includes the railroad company, the engineer, conductor, locomotive and rail car manufacturer or others. In addition to determine who is responsible, the lawyer can also calculate the degree of liability of everyone at fault. This amount will usually determine the financial worth of the case in terms of obtaining financial recompense. Because of state and federal law, litigating a railroad crash accident to protect the rights of the victims can be complex. Unfortunately, like most common carriers, railroads are notorious for denying responsibility, especially for accidents happening at railroad crossings. However, an experienced law firm will perform a proper investigation to provide expedient, attentive and thorough client service and legal representation. Facts can be determined and lawsuits filed to pursue financial compensation for a wrongful death or a catastrophic injury following a railroad accident. Rosenfeld Injury Lawyers LLC have successfully represented many victims of serious train accidents suffering injuries and death. The law firm at (888) 424-5757 can study the merits of the case, and provide legal assistance on proceeding with a claim or lawsuit. The attorney’s efforts will ensure that rightful compensation is obtained to cover medical expenses, personal losses, lost wages, and pain and suffering. It is imperative to hire an attorney for legal representation before the deadline (statute of limitations) expires.